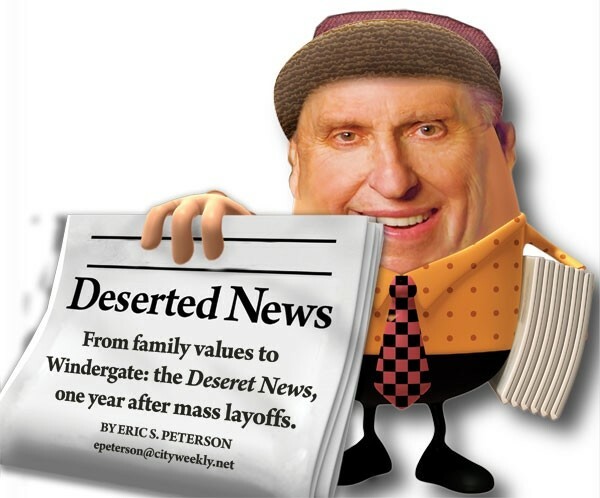 In the summer of 2010, gallows humor set in at the Deseret News office after a litany of closed-door manager meetings stoked rumors of layoffs. Around the office, staff cracked jokes like “See you tomorrow—I hope.” When the paper’s management announced the creation of an editorial board of “thought leaders” that included longtime homeless advocate Pamela Atkinson, staff joked that Atkinson would be at hand to help laid-off employees get on food stamps and find low-income housing. Privately, staff members were anguished about what was coming. Julie Williamson, a then 50-year-old copy editor and weekend city desk editor who had spent 25 years in journalism, says the rumors made her physically nauseated and she would wake up in the middle of the night and chug Mylanta to calm her stomach. On Aug. 31, rumor collided with reality and 43 percent of the staff was laid off—53 full-time and 28 part-time employees. Laura Hancock, a reporter at the paper for 11 years, describes the process of being explained severance and job assistance like an out-of-body experience. “I literally felt my blood go cold,” Hancock says. Some opined that the pink-slip massacre at Utah’s second largest, and longest-running, daily newspaper was pure cost-cutting. Rep. Stephen Handy, R-Layton, who worked as a marketing director for the Deseret News during the ’90s, says the large staff was always something the paper realized it would need to trim. “But then it’s like they applied a meat ax to it,” Handy says of the 2010 layoffs. He notes another change that happened since the layoffs—an increase in the number of church-news writers, positions he says traditionally were considered “untouchable” when it comes to eliminating positions. But for Deseret News CEO Clark Gilbert, it wasn’t so much streamlining as it was evolution. Gilbert, an organizational wonk and former Harvard Business School professor, came to the Deseret News in May 2010, taking years of academic research and putting them into play. While Gilbert could not be reached for comment despite repeated attempts, his past scholarship and interviews give a glimpse into what he’s created—a news organization that embraces the digital frontier by “decoupling” itself from the old print product. The new model calls for catering to a global Mormon audience, who are already avid readers of the paper, which is owned by The Church of Jesus Christ of Latter-day Saints. Doing that means broader, more generic stories on “values” reporting that would appeal to all people of faith—but especially to those of the Mormon faith—like Gilbert himself. Flash forward to fall 2011, and the company has gathered an “army” of roughly 1,000 low-paid contributors who provide content through the Deseret Connect program, which publishes the stories in outlets like the Deseret News and KSL.com. Like a Latter-day Huffington Post, the model has reportedly generated millions of online hits, but in the process has also generated plenty of controversy—especially in November 2011, when Mike Winder, mayor of West Valley City, the second most populous city in the state, admitted to using the fake name Richard Burwash to publish positive stories about his city after having watched the Deseret News all but give up covering West Valley City. While Winder showed how easy it was to dupe Deseret Connect, perhaps more concerning is how Deseret Connect encourages city staffers to write news articles about their own cities and allows some contributors to write positive articles about their own business affairs with little apparent disclosure. One contributor who has written positive stories about Park City government and the Utah Department of Transportation is listed on DeseretNews.com as a “communications consultant.” What’s not disclosed is that the writer is a public-relations employee of an engineering firm, whose clients include Park City and UDOT. For print and digital expert Richard Hanley, a professor at Quinnipiac University in Connecticut, the problem is that many “new” news-organization leaders like Gilbert forget that they’re not in the information business. Disruption is the name of the game when it comes to the point of Clayton Christensen’s The Innovator’s Dilemma. Christensen, a mentor of Gilbert’s, argued that good businesses could face extinction by not being ready for technological innovation. Gilbert went further on this premise in From Resource Allocation to Strategy, a 2005 book he co-authored, arguing that newspapers often were too late in committing resources to going digital and then often make the mistake of repurposing the print product online. In the book, Gilbert cites one newspaper that flourished with a digital division that was “structurally decoupled” from the parent organization. After the shock and awe of the 2010 layoffs, Gilbert flipped the traditional resource allocation on its head—sacking the traditional print-media side nearly out of existence and merging it with the KSL TV and Radio media center in the downtown Triad Center. While the old guard of Deseret News print reporters shared the first floor with TV and radio reporters—rebranded as “news specialists”—the fifth and sixth floors of the center were dedicated to the new breed: a digital-focused, values-enterprise team. Their prerogative was to write general stories focusing on six values areas: families, education, faith, care for the poor, financial responsibility and media values. “For some reason, we’ve been stuck in the print display and classified model and not reinvented around the digital model that is blossoming all around us,” Gilbert said at an October forum on the media at the University of Utah. A source with extensive firsthand knowledge of the combined Deseret News/KSL operation describes two newsrooms—one blossoming while the other withers on the vine. “X,” whose name City Weekly has withheld to protect the source’s identity, says the “values” team that shares office space on the fifth and sixth floors with management, church news and the digital staffers works with better equipment than the first-floor reporters. The values team can easily be expensed for long-form stories that may require out-of-state travel, but for traditional reporters to be expensed for travel outside of Salt Lake County, it’s like pulling teeth. 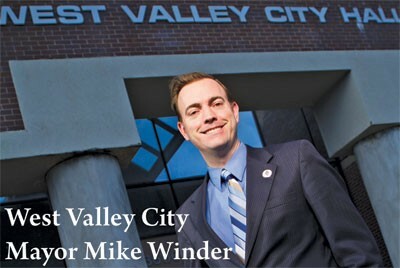 For a time, reporters were encouraged to monitor online hits for their stories, X says, suggesting that was the guiding principle, which X says unfairly skewed local coverage toward crime stories—a complaint West Valley City Mayor Winder had with the paper. Management would push reporters in that direction and then equivocate, saying the crime stories were hypocritical to their values mission.